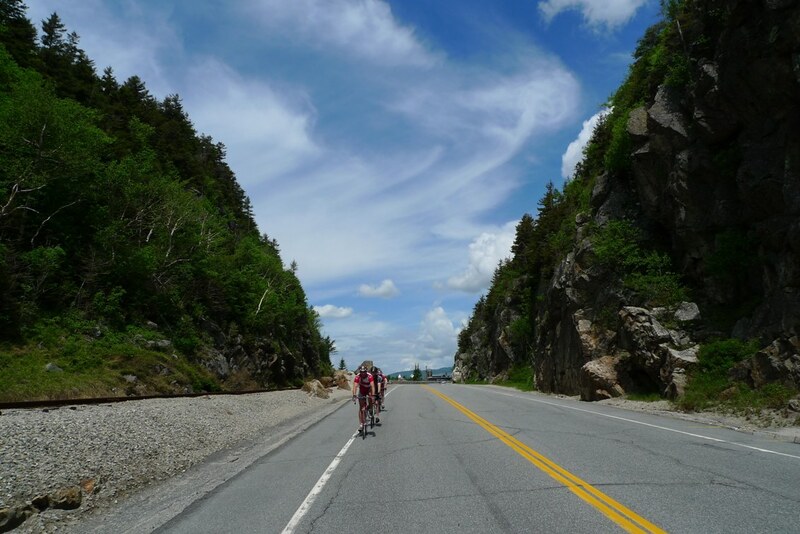 The White Mountains of New Hampshire offer endless route possibilities in mountainous terrain. The 4NaaP route presented here is almost certainly the most popular loop, as it hits the most scenic areas on good roads. As the title implies, this loop will crest four notches and one pass. 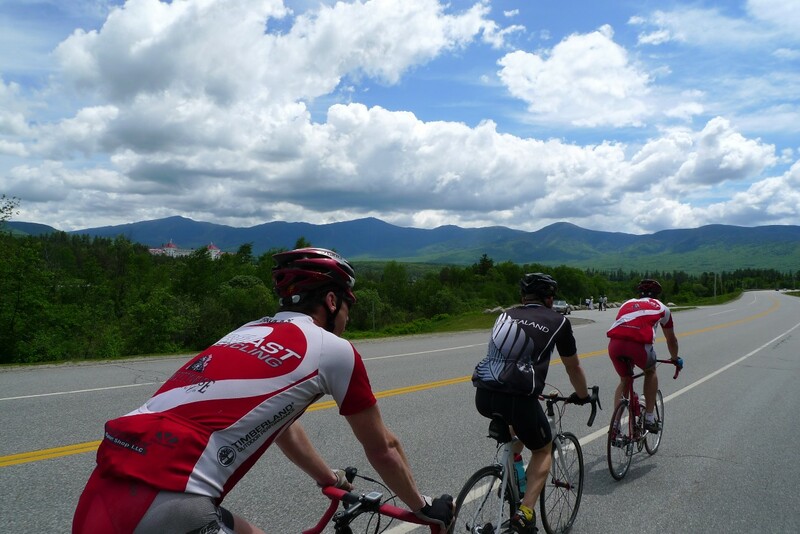 These are Kinsman, Franconia, Crawford and Bear Notches, finishing up with Kancamagus Pass. The loop is popular among recreational and competitive riders alike. This ride conveniently starts at the White Mountains Visitor Center in Lincoln, NH. This is just off I-93 at Exit 32. There is ample parking and restrooms for changing before and after the ride. Heading west on Rt 112, you will pass through the small village of North Woodstock. Climbing begins shortly thereafter. 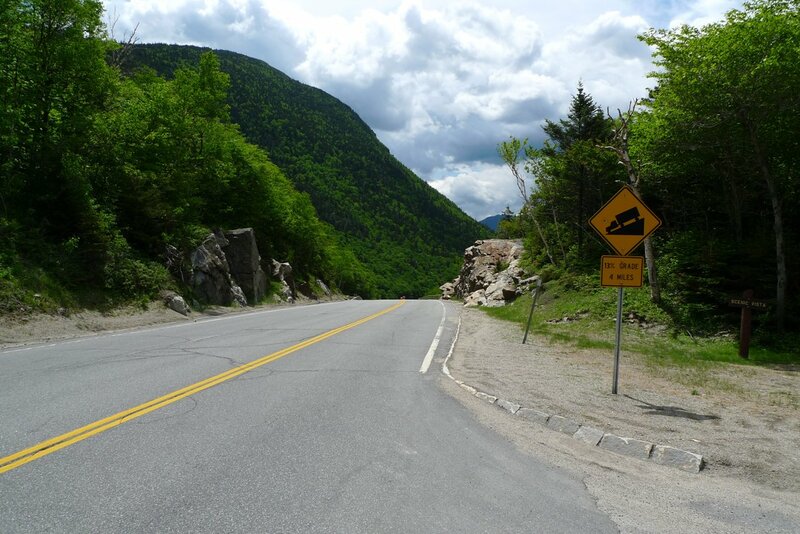 At first, you think Kinsman Notch isn't all that tough. Enjoy the gradual lead-in. It will be steep before you know it. The last mile or so averages about 12% grade. The scenery to both sides will become increasingly rugged, just to let you know you aren't in Kansas anymore. The unspoiled views up top are quite sweet. Don't hang out up there too long waiting to regroup. There are four more climbs to go. Descending Kinsman to the west is quite mellow. Nothing like going down the side you just came up, where I nearly hit 60mph once. You'll descend gently for several miles before taking Rt 116 to the north. This will throw several punchy short climbs at you before reaching the village of Franconia. There are refueling options here, the small grocery store right across the intersection being one of them. Bear right on Rt 18 to head towards your next climb. This is up the back side of Franconia Notch. After a couple miles, the grade kicks up to around 10% and stays there for a couple miles. 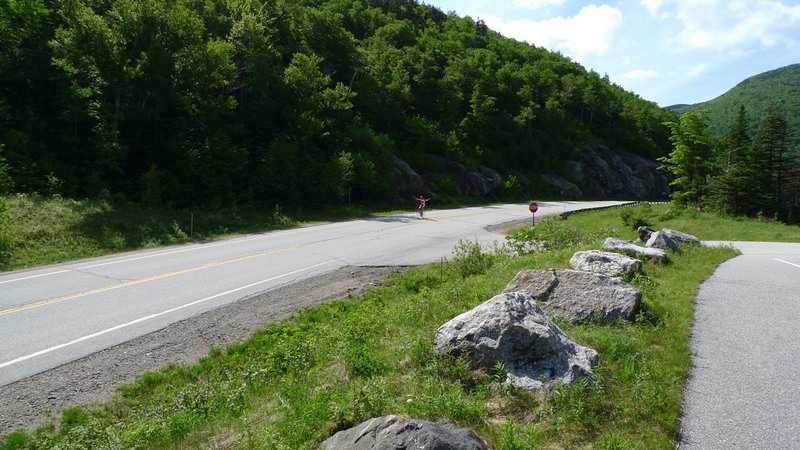 This loop doesn't pass through Franconia Notch proper, which requires riding the bike path. Some riders link the bike path into loops, but in the summer it can be a frustrating experience. The path is packed with families and many clueless people. You are required to walk your bike in a couple high traffic areas too. Just not worth it in my opinion. Better to stick to the roads. In late fall, the path may be much more bike friendly. 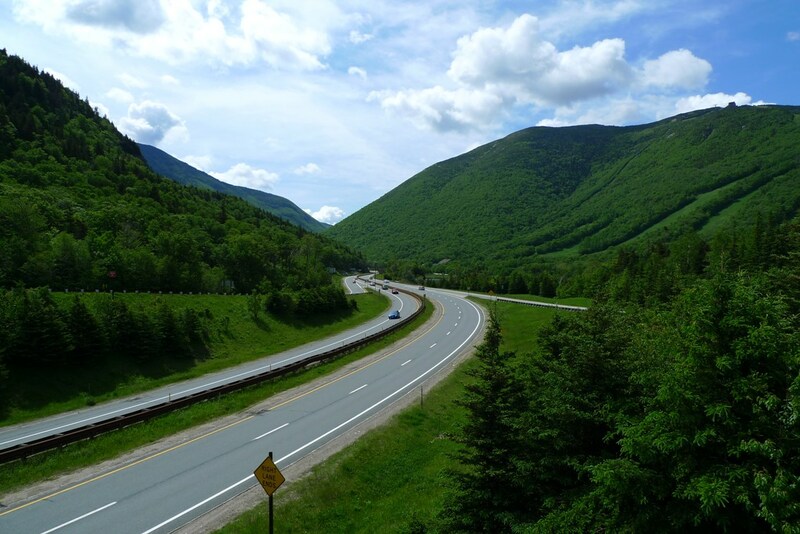 After cresting Franconia Notch at the Cannon Mountain Ski Area, pass over the highway, go left, then shortly merge onto bike path heading north. This part of the path is ok because there are no popular tourist attractions on this last northern bit of the path. The path will pop you out on Rt 3. Continue heading north to Twin Mountain, many miles of gradual downhill on good road. 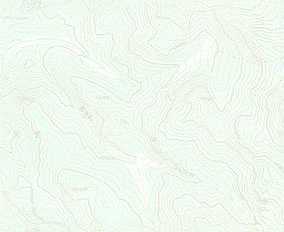 Get a paceline going and prepare to cover serious ground in a brief time. When you reach the stoplight at Rt 302, turn right. This road will have more traffic on it, but it is well shouldered in most places. There will be a couple of food options further up. If you haven't stopped for water or fuel yet, you will probably want to do it on Rt 302, as there is no longer a country store at base of Bear Notch and nothing on the Kancamagus Highway. 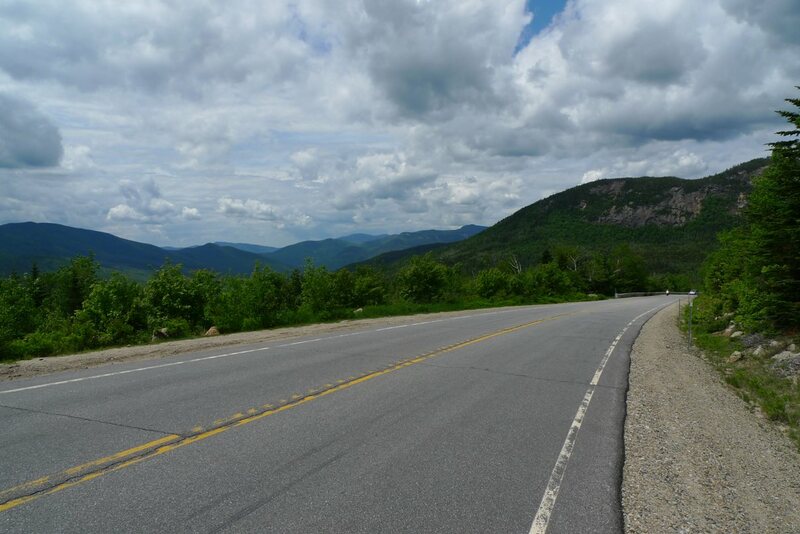 Rt 302 will go over Crawford Notch, the third climb of this ride. Although approaching Crawford from this direction hardly feels like a climb. It gains ever so gradually, except for the last few hundred feet of vertical. Once you pass through the tight notch though, expect a thrilling descent. There are some divots in the road, and if the waterfalls on your left are running, expect tourists to walk right out in front of you from the parking areas on the right. After the initial plummet, you will continue to descend for many miles on Rt 302. Often you have tailwind here, so you can maintain speeds of 30+ mph with little effort. In Bartlett, you will pick up Bear Notch Rd on your ride. This will be your fourth climb, with a perfectly consistent 6-7% grade, gaining 1200ft. This is a nice climb to get into a rythm on. Before you know it, you are over the top. Descending the other side, you will have a small climb along the way and drop only 600ft total. At the bottom, turn right to begin your final climb of the day. The first five miles or so of the Kancamagus Highway are pretty nearly flat. The last 4.5 miles up to the pass are moderately steep. If you hit most of the other climbs with high intenstity, you will surely feel it on this last climb. The best part of this loop is how the ride finishes. From the top of Kancamagus Pass back to the cars in Lincoln, you will drop 2200ft over 14 miles. It is a sweet way to end a ride. Hopefully you won't have too strong of a head wind heading down. Grab a milkshake and coffee to go from McDonalds for the drive home.